The official Premier League site have published their latest FPL Dream Team. This is taken from performances/stats in match week 30 of the Premier League. 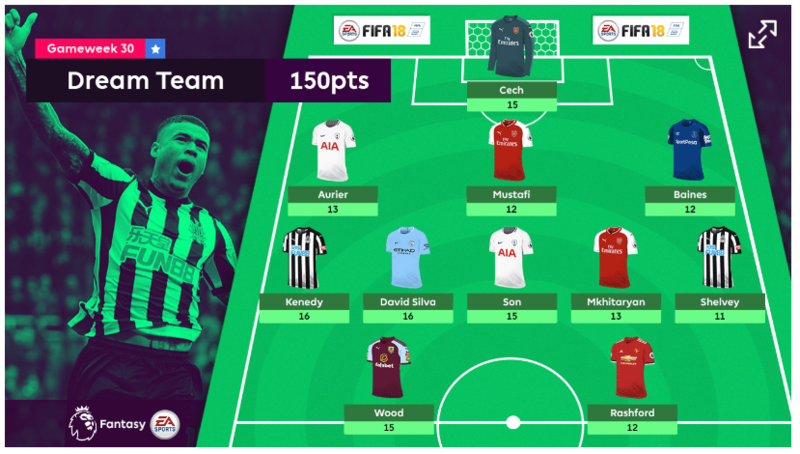 The FPL Dream Team made up of the 11 players who have produced the most Fantasy Premier League points. Two Newcastle players make the team. Nobody produced more points than Kenedy thanks to his two goals, he generated 16 FPL points, the same as Man City’s David Silva. Jonjo Shelvey also makes the team, his two assists against Southampton helping him produce 11 points. ‘Kenedy With two fine strikes for Newcastle United in Gameweek 30 Kenedy (£4.7m) announced his potential for Fantasy Premier League points. The Brazilian’s brace against Southampton set the Magpies up for a crucial 3-0 win and put FPL managers on alert for a budget midfielder who can free up funds for the run-in. Along with David Silva (£8.0m) Kenedy was the game’s joint-top points scorer, earning himself a debut appearance in the Dream Team line-up. The joint-top scoring player for Gameweek 30, the Magpies’ on-loan winger supplied his 44,000 owners with two goals and maximum bonus points in the 3-0 home win over Southampton. Along with Kenedy, the Newcastle midfielder also claimed a first Dream Team appearance of the season. Shelvey’s pair of assists against Southampton produced his first set of attacking points since Gameweek 7.